Hey everyone! 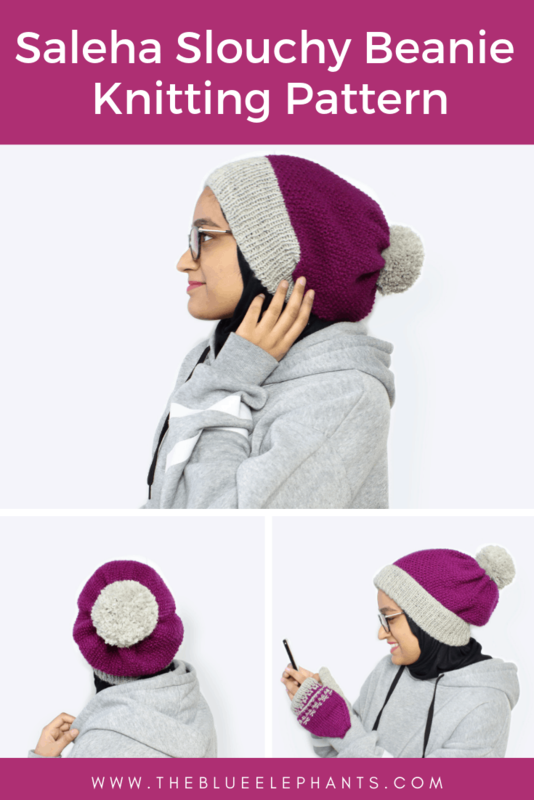 This week, I want to share with you a super simple slouchy beanie knitting pattern. 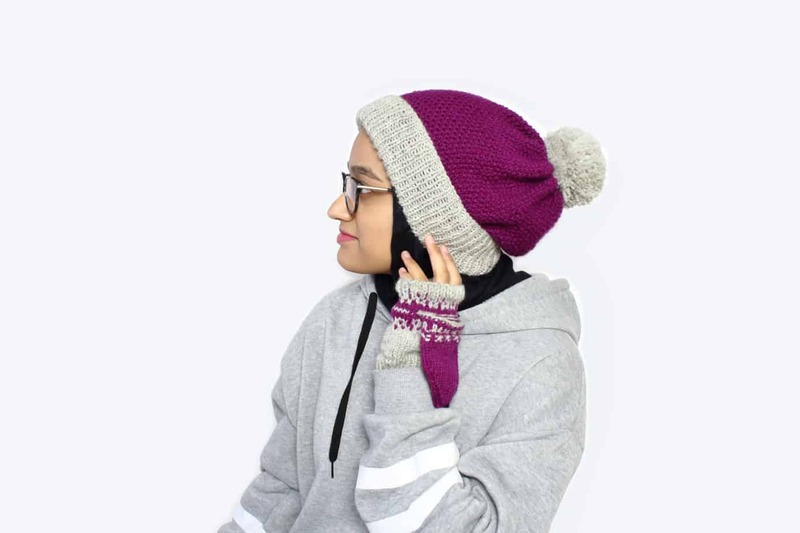 This is the Saleha beanie to go along with the Saleha Convertible Gloves pattern I shared last week. This pattern is really easy to make and wear, and it only uses basic knits and purls. 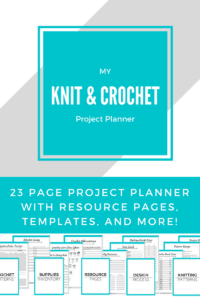 I love the Knit Picks Brava yarn I used to make this set, especially in the color Fairy Tale, but there are so many colors to choose from and they would all look amazing! So, let’s get right into it! 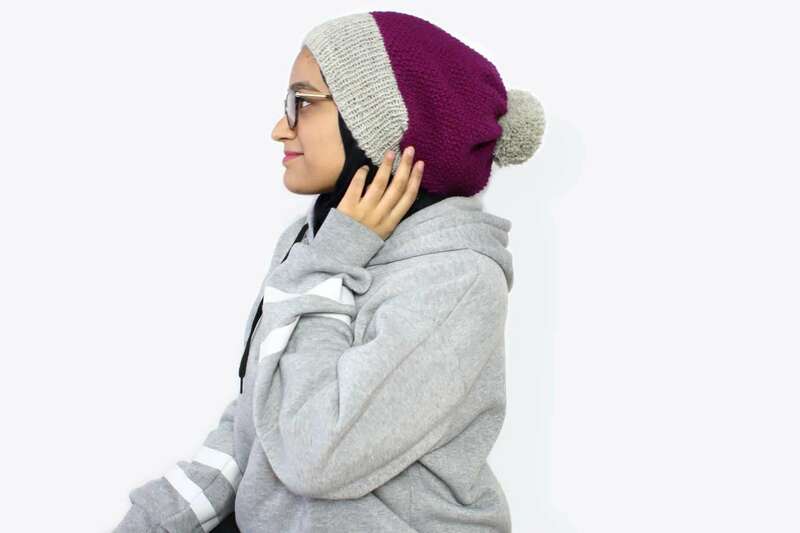 This slouchy beanie knitting pattern has an extra long ribbed section that’s perfect for doubling over for a folded brim or leaving it long for more of a laidback, slouchy look. The main “body” of this beanie is done in seed stitch and the texture really shows off the color of the yarn. I worked in continuous rounds for the bulk of it and finished with a couple of decrease rounds to bring it all in. Then I made a massive pom out of leftover yarn and it was done! It would also look cute without the pom, but I can’t get enough of them! 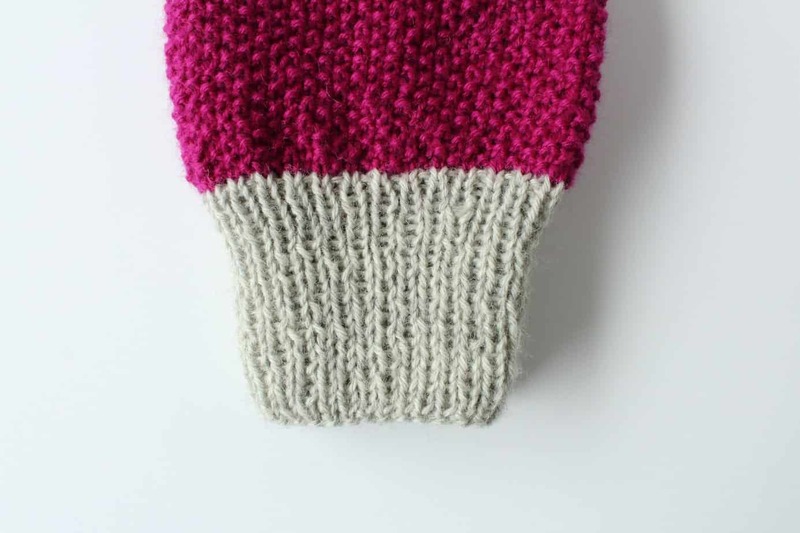 This beanie was made for my niece, Saleha, along with a pair of convertible gloves using the same yarn. 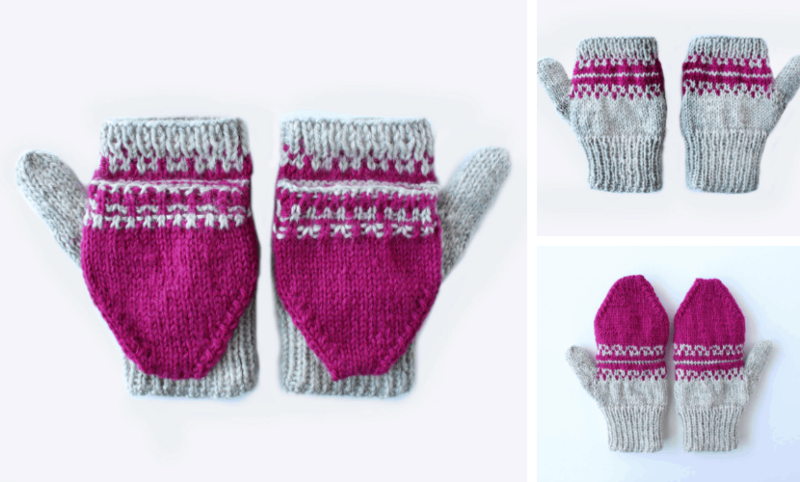 These gloves are also fairly easy to make but they do involve some colorwork and a couple of extra tricks, but I walk you through them in the pattern. You can use the simple version if you want to, but if you’re new to making gloves, go and give these a try! Round 1: With the CC, cast on 110 stitches using a knitted cast on. Being careful not to twist the stitches, join to work in the round and place a stitch marker. Rounds 2-22: *Knit 1, purl 1* all the way around. 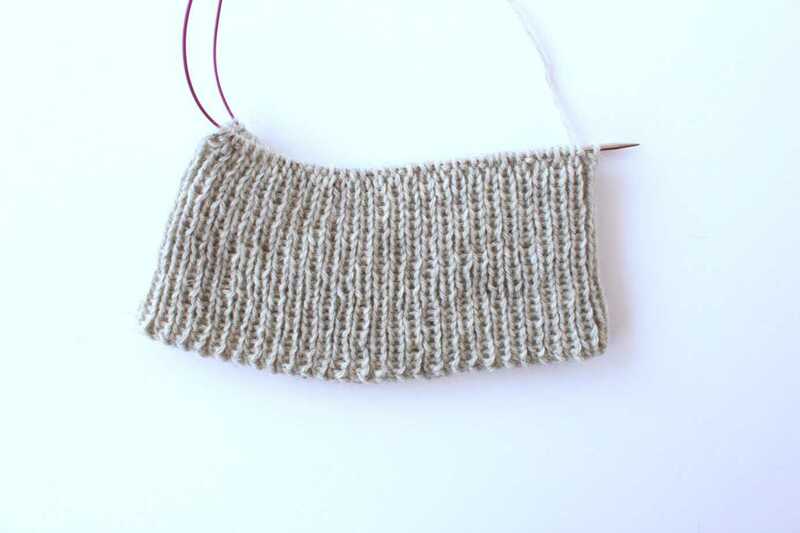 Continue working in 1×1 ribbing until the cuff measures 3.5-4 inches from the cast on edge. Round 24: *Knit 1, purl 1* around. Round 25: *Purl 1, knit 1* around. Repeat rounds 24 and 25 to create the seed stitch texture for the body of this slouchy beanie knitting pattern. Continue until your beanie measures 7.5 inches from where you attached the main color yarn, ending on a round 25. Round 1: *Knit 1, p3tog* around. Rounds 2-3: Work 2 more rounds of seed stitch, purling the knits and knitting the purls from the last round. Repeat round 1-3 two more times to decrease the top of the beanie. Trim the yarn so that you have a long tail and thread that tail through a tapestry needle. Bring the needle with the tail yarn through the remaining stitches and slide the stitches off the needles. Pull to close the top of the hat and secure the tail with a knot. Then weave in any loose ends and trim the excess yarn. 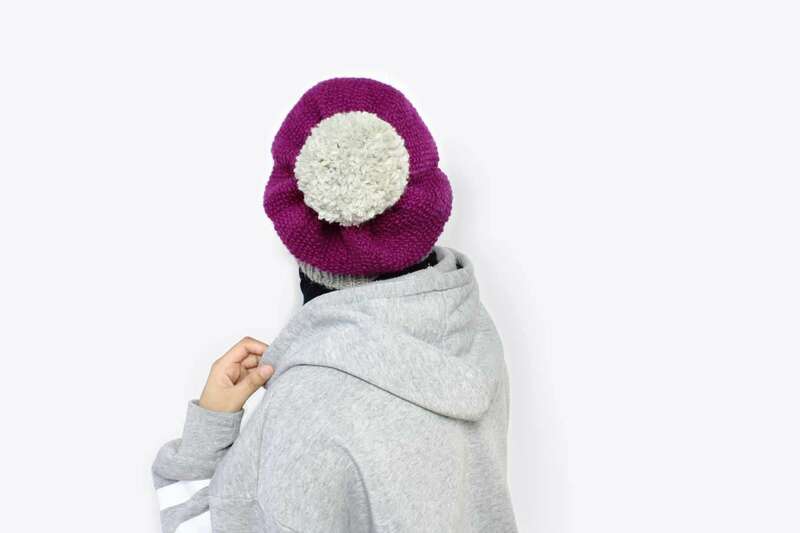 Now, just add a pom to the top of the beanie to finish it off. I made mine using the same Dove Heather yarn as the cuff and a large pom pom maker. Or you can attach a ready-made one. 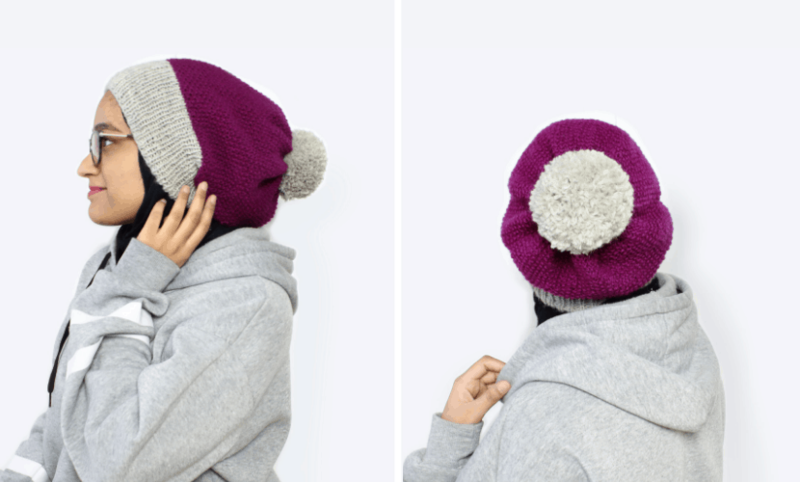 No matter how you make the pompom, be sure to sew it on securely to the beanie. I like to take my time and go around the base of the pompom, making sure that it doesn’t wobble too much when I shake the hat around a little. And you’re done! I love this slouchy beanie so much; the color, the texture, and just how easy it is to size makes it the perfect pattern for beginners. 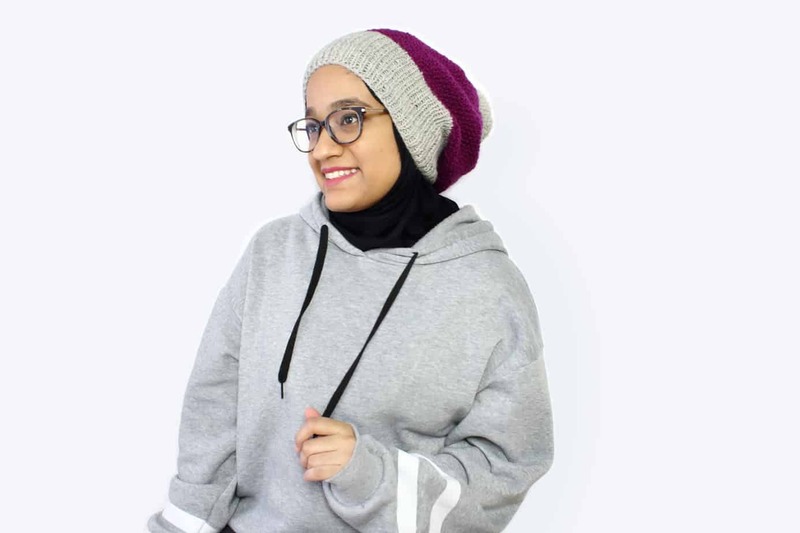 This beanie along with the Saleha gloves are so fun to make and it was really rewarding to see it come together. I made these a while ago, and the technique and neatness just weren’t there 2 years ago. These are new and improved pictures of the same pattern, made 2 years later. It just shows how much practice helps! 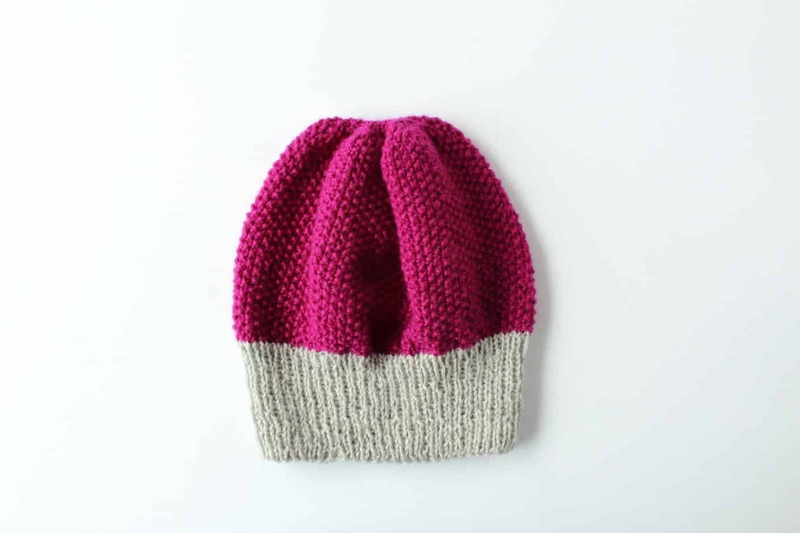 Beanies are a great way to learn to knit because you can make them as simple or as complicated as you want. Personally, I love using the “body” section of a beanie to try out new stitches and textures. 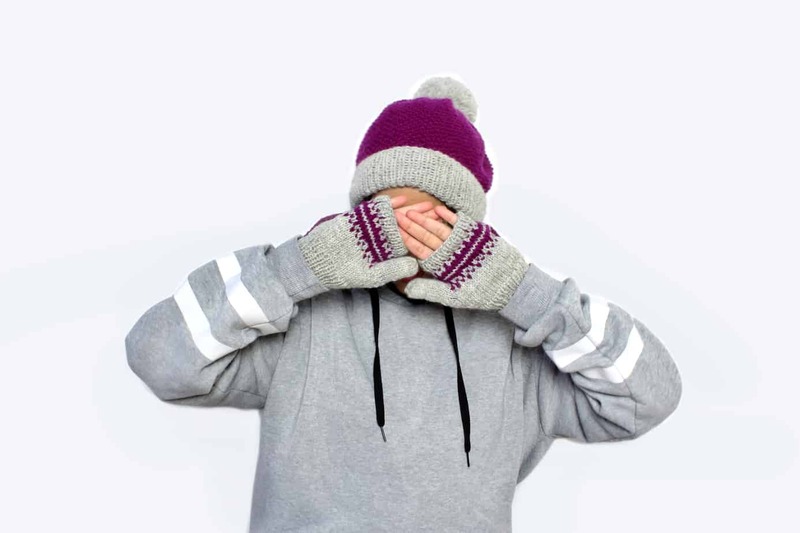 If you’re interested in learning more about knitting beanies or knitting anything, you should check out Bluprint for online classes on all kinds of topics, from knitting basics to more advanced techniques! The old pictures! I also took a photography class on Bluprint that really helped! Thanks so much for reading. If you liked this, be sure to subscribe to the weekly newsletter using the box below! 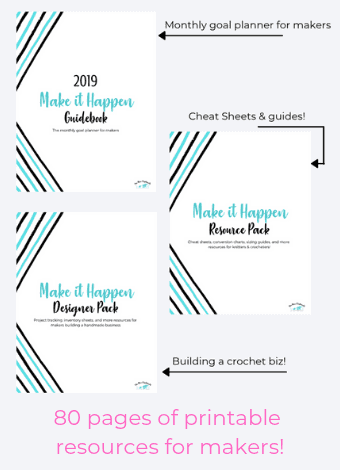 You’ll get new patterns, tips, and tutorials delivered right to inbox every week, and you’ll get access to the subscriber-only resource library with even more freebies! Just sign up below and you’re done.